The first Friday of each month marks Gallery Cruise on Vashon, where local businesses open their doors and donate their walls to showcase works by island artists. One such artist, Pam Ingalls enjoys rock-star status for her award-winning paintings. 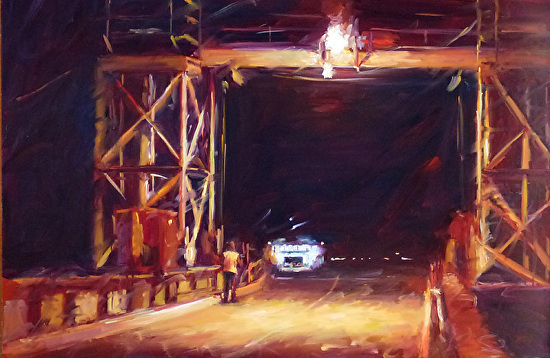 Her work has been been juried into more than 125 national and international shows. And to top it off, she’s an amazingly nice person. Tom’s kitchen with art critics Boz and Gracie; both painfully aware of their absence in the original painting. “Slipping in,” a painting every islander can relate to. Several years ago, Pam was visiting on a bright summer day, and taking a few snapshots of the old homestead. She knew the house well, for her dear friend Karin and Buzz lived there before I planted my own roots in the Peach Palace. 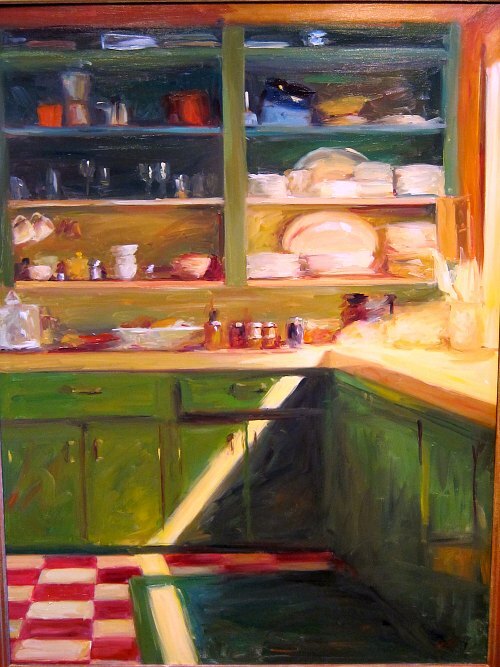 Apparently the light in my unusually tidy kitchen caught her eye that day, and she captured it again years later in a wonderful painting called Tom’s Kitchen II. If I stare long enough, I can smell pie. The 118 headed to the dock on a rainy winter morning. Pam is known for traveling all over the world and capturing the essence of place and person. What I like about this show is how I’m able to see where I live through her eyes. I’ve never been to northern India or the backstreets of Rome, but I’ve slogged to work on the 118 bus to the ferry dock. I’ve never seen the red clay of the Mara, but I have leaned against the red bricks of the Landing Building on the corner of Bank and Vashon Highway. Adam of Snapdragon Bakery, takes the cake, the chocolate-covered cupcake. Previous articleFree Range Fruitcake: Something to Cluck About! Its amazing! Love the kitchen! Whats in Tom’s kitchen I? What a great painting, Tom. Looking forward to visiting Vashon on First Friday for the gallery cruise. 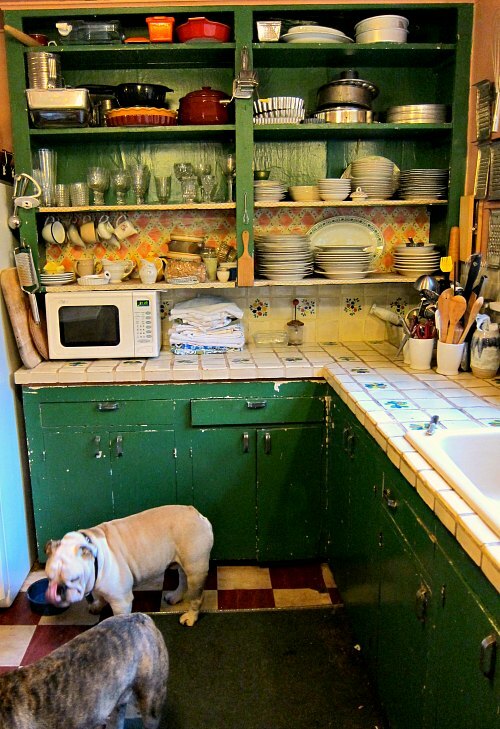 Love your funky kitchen! What a great painting! I would love to have a print of this. Does she make cards?? The kitchen is so cozy and inviting. Love the light! Pam, I’m not sure if she does make cards, but now I’ll have to ask her, and I’ll let you know. Beautiful paintings – your friend Pam is very talented, indeed! 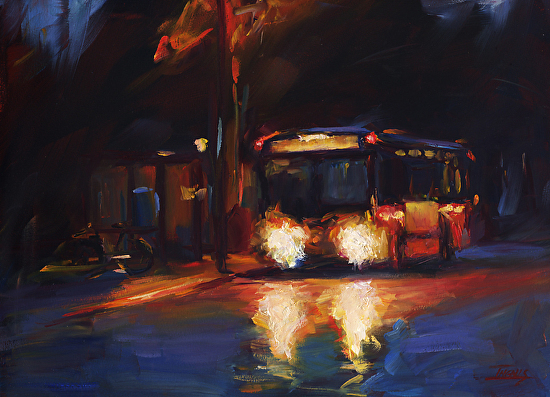 I like the way she captures light – coming into your kitchen, the headlights of the bus in the rain. Thanks for posting these! It’s a beaut, but I didn’t buy it. I love Pam’s work but it’s a bit out of my price range. If I had enough dinero and wall space, I would have bought that spectacular painting in a New York minute …..
Well Brooks, you are a woman of refined taste and keen style! Really, really like Pam’s paintings (especially the painting with cupcakes!). But can’t believe she didn’t include Boz and Gracie in the kitchen. Eileen, in Pam’s defense, Boz and Gracie were firmly planted on the front porch that day, soaking up the sun and moving for no one. Tom…how lovely. Pam’s art is truly beautiful! I love your country kitchen! How cool is that…both the kitchen on canvas and the original too. What a wonderful painting, and a wonderful kitchen. The artist really capture it. Wow! Thanks for posting the paintings, Tom! It’s especially fun to see your kitchen photo! It would have been fun to have your canine companions in the painting. Maybe in Tom’s kitchen III?! To answer the couple of questions- “Tom’s Kitchen I” was a tiny painting of the same scene that I did a couple of years ago. It was sort of like a sketch for this big painting. And yes, I do make cards and prints of some of my paintings. I’ll have them at my next show in May. Or you Can just contact me (pamingalls.com), and I’ll make sure you get some. Thanks again, Tom! Great blog, btw. Now I’m hooked! what a great surprise! to see one’s kitchen immortalized this way. LOve the painting, she is a true artist!